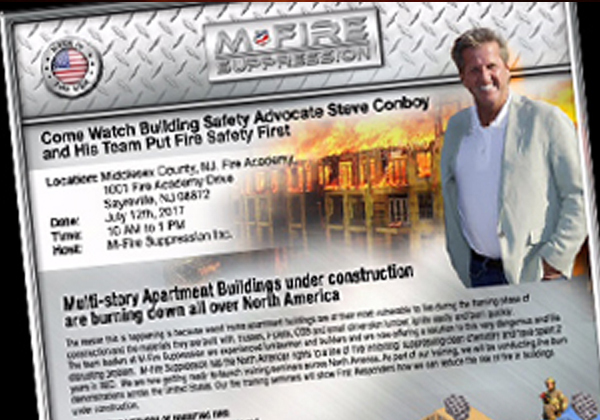 Last year we traveled around the country to burn wood framed buildings in front of Building Safety Professionals, Fire Chiefs and Fire Fighters. This year, we are defending wood framed buildings from fires during construction all around the country. M-Fire is now reaching out to all the Insurance Underwriters, that now, there is a new Best Practice for wood framed buildings. We are successfully advocating that Architects, Engineers, Builders, Framers, and Home Owners should get a premium reduction for using best fire practices. Those that still take the risk and ignore the need to embrace the safest and most effective best practice that protects wood framing during construction and make jobs safer for all the workers should pay higher premiums.